The Gonzales Family Goes To Camp! 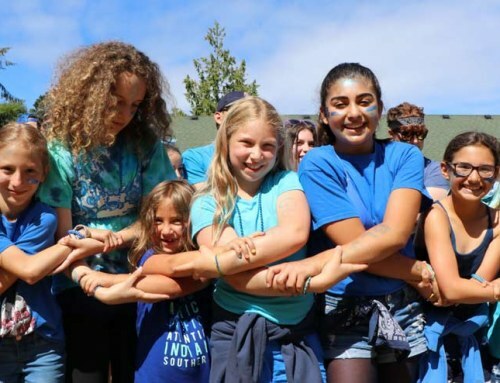 “Mom, when are we going back to BB Camp?” These are the words that I’ve heard at least once every two weeks for the past year…since a rainy, muddy, indoor Family Camp ended just over a year ago. Jackson is only five years old, but BB Camp already holds a special place in his heart. 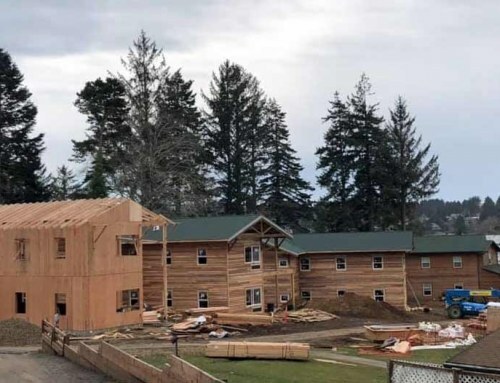 When the packing list showed up in my email inbox a few weeks ago, we started having daily conversations about what we would bring, which bunk beds we’d sleep on, what piano song to perform in the HIGHLY-entertaining talent show, and what games to play in the ever-special game room. But this year would be better….Dad was coming with us! We packed up the car on Friday morning, took a leisurely drive to Lincoln City, and rolled through the gate just in time to see the sun peek through the clouds, and light up Devil’s Lake. What Jackson didn’t realize is how ma ny more things there are to do at Camp when it’s not raining. 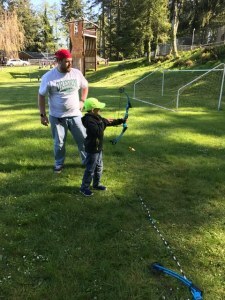 We took advantage of every opportunity to have fun in the sun (since we haven’t seen it for six months): Ga-Ga, climbing on the playground, canoeing, rock climbing, archery, bounce-housing, a ride on the speedboat, and more. For Justin (my husband) and I, the real treat was the few hours of kid-free time on Saturday morning. The young’uns were split up by age group for activities led by BB Camp staff. We opted for a heated ping pong match (I lost three times), had the wind push us around on a kayak, and then we took a much-needed nap….it was GLORIOUS! The time spent together as a family was wonderful, but it was equally special to connect with friends. 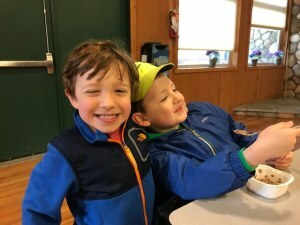 Jackson was lucky enough to have his classmate, George, at Family Camp too–the boys were nearly inseparable for two full days! As a member of the BB Camp Board, it was heartwarming to connect with several of my peers and their families. I especially enjoyed a late-night song circle on the deck of the dining hall—I think we even used the same song book from when I attended Camp 23 years ago. I’d be r emiss if I didn’t also mention the subtle, but warm threads of Judaica that were incorporated into the weekend. We appreciated saying the Motzi before meals, the SUPER-DELICIOUS chocolate challah at Shabbat dinner, and the peaceful songs of Havdalah. Jackson is often an emotional kid, especially when things don’t go his way. I’m thrilled to say that for three days we didn’t see tears…with only one exception. 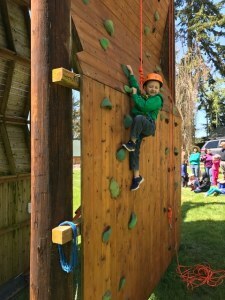 As we pulled away from Camp on Sunday afternoon, Jackson started thinking about all the activities he didn’t have time for…. his eyes welled up. I assured him that we’d be able to zip-line, play kickball, do arts and crafts, and more next year. I’m especially thankful to the BB Camp staff for their hard work, their attentiveness, and commitment to showing everyone a great time! Family Camp 2017 was really special for our family, as I’m sure it was for so many others. We will definitely be back! Anna Gonzales grew up in Eugene and attended BB Camp as a camper in the early 90’s. She is in her second year as a BB Camp Board member and serves on the Marketing, Gala, and Capital Campaign committees. 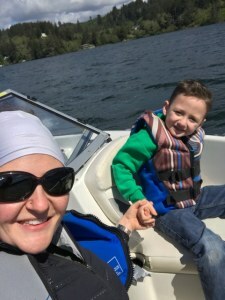 Anna has experience working for Jewish camps and currently lives in Beaverton with her husband, Justin and son, Jackson (age 5). She works full time for the American Cancer Society, and enjoys spending time outdoors hiking, biking, and gardening. Join BB Camp for the next Family Camp – More info and register here!